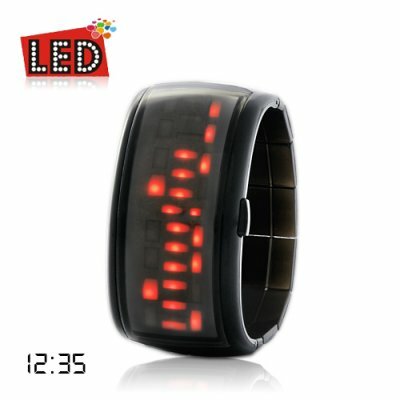 Successfully Added Anno Domini - Japanese Style Red LED Watch to your Shopping Cart. Introducing the Anno Domini Japanese red LED watch from the year 2911, a period of peace when the world is governed by a cabal of technocrats in the form of 7 hyperintelligent teenage girls, which gives its wearer wizard class hacking skills and massive moxie by refusing to tell time as it's always been told. You mean this watch really tells the time? Yes, even though the Anno Domini embodies Hauru no Ugoku Shiro design and Sen to Chihiro no Kamikakushi style with its neo-gothic numerals and black lacquer flexi-bands which resemble bridge planks, as a metaphor to bridge the gulf that exists between reliance and independence in the lives of teenage girls everywhere, this Japanese red LED watch does in fact tell the time and does so really efficiently too! Slip-on Bracelet/Material: Isotopic neo-acrylic polymer from the planet Triacus (Star Trek reference). If you're looking for the perfect gift for your girlfriend, this is it. Nothing speaks that you celebrate her womanly powers and intelligence than an Anno Domini Japanese LED watch.